Have you looked in the mirror lately and noticed that your teeth appear to be getting longer? Are you wondering how this could happen? Your dentist in Annapolis says you may be experiencing gum recession, and as you continue reading, he’ll explain what causes it. In addition, he’ll reveal ways to prevent this problem and how your oral health can be restored with the proper treatment. The primary cause for gum recession is that there has been a prolonged infection that has begun to destroy the underlying jaw bone. Without the proper amount of bone present, your gum tissue then retreats, setting off a chain reaction of events. The next step, then, is that your teeth are left vulnerable to falling out as the infection worsens, and there is less bone and gum tissue available to hold them in place. Re-evaluation of Oral Hygiene – The least invasive method of addressing gum recession is for your dentist to advise you of ways to improve your oral hygiene habits. That may include suggesting a different type of toothbrush or reviewing your flossing habits and technique. Scaling and Root Planing – The scaling and root planing procedure is where your dentist will clean beneath your gums in the pockets that surround the roots of your teeth. It also includes your local professional smoothing the rough areas along the roots so that they don’t attract new bacteria. 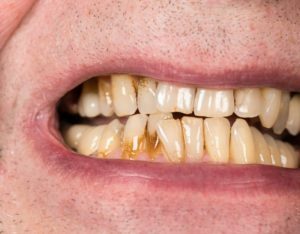 Gum Graft – More severe cases of infection may require that your dentist perform a gum graft, which is where he’ll remove healthy tissue from another part of your mouth to replace the damaged gum tissue. Stop Gum Recession Before It Starts! The best remedy for a problem is to prevent it from happening. This is accomplished by simply practicing excellent oral hygiene, which includes brushing and flossing your teeth correctly at least two times a day. By doing this on a consistent basis, you will be better able to control bacteria growth and prevent infection. In addition to maintaining an oral care regimen, it’s important to visit your dentist semi-annually for cleanings and examinations. The former will remove any stubborn plaque and tartar that cling to your teeth and at the gum line, while the latter allows your dentist to detect any problems early. Thus, if there is an issue developing, it can be addressed well before it becomes more troublesome. It’s empowering to know that you have the ability to prevent gum recession and enhance your oral health. Thus, you are encouraged to take the proactive approach and reach out to your Annapolis dentist to schedule a preventive care visit today! A graduate of the University of Maryland Baltimore College of Dental Surgery, Dr. Earl L. Chambers III has been practicing dentistry for over two decades. Still, he remains driven to learn more, which is why he pursues continuing education and maintains membership in several professional organizations. Dr. Chambers practices at Chambers Family Dentistry and can be reached for more information through his website.